Quick overview Key documents and appraisals of appropriation art. Includes Dada, Situationist and postmodern theory, and recent feminist, postcolonial and postproduction practice. Many influential artists today draw on a legacy of 'stealing' images and forms from other makers. 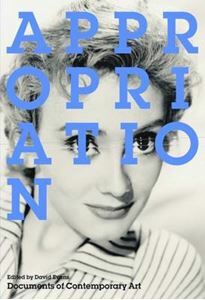 The term appropriation is particularly associated with the 'Pictures' generation, centred on New York in the 1980s; this anthology provides a far wider context. Historically, it reappraises a diverse lineage of precedents - from the Dadaist readymade to Situationist detournement - while contemporary 'art after appropriation' is considered from multiple perspectives within a global context. Artists surveyed include Akasegawa Genpei, Santiago Alvarez, Art Workers Coalition, Ross Bleckner, Marcel Broodthaers, Victor Burgin, Maurizio Cattelan, Hans-Peter Feldmann, Douglas Gordon, Johan Grimonprez, Peter Halley, Hank Herron, Pierre Huyghe, Mike Kelley, Idris Khan, Barbara Kruger, Sherrie Levine, Glenn Ligon, Steve McQueen, Alexandra Mir, Keith Piper, Richard Prince, Jorma Puranen, Cindy Sherman, John Stezaker, Retort, Martha Rosler and Philip Taaffe. Writers include Malek Alloula, Jean Baudrillard, Walter Benjamin, Nicolas Bourriaud, Benjamin H. D.Buchloh, Johanna Burton, Douglas Crimp, Thomas Crow, Guy Debord, Georges Didi-Huberman, Marcel Duchamp, Okwui Enwezor, Jean-Luc Godard, Isabelle Graw, Boris Groys, Raoul Hausmann, Sven Lutticken, Cildo Meireles, Kobena Mercer, Slobodan Mijuskovic, Laura Mulvey, Jo Spence, Elisabeth Sussman, Lisa Tickner, Reiko Tomii, Andy Warhol and John C.